Plenty of enthusiasts are waiting with bated breath for when the 2020 Ford Explorer ST arrives at Southern California Ford Dealers. That’s understandable, considering it’s not everyday a three-row SUV gets a humongous performance boost like this. While you can check out the current selection of Ford SUVs, the Ford Explorer ST will definitely be a standout among them. We don’t have every detail about this upcoming model; however, the following is what we do know. 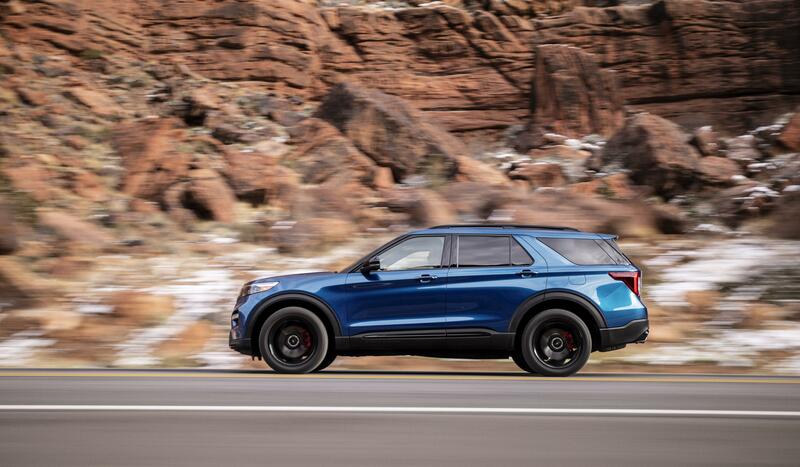 It only takes one glance to realize there’s something different with the upcoming Ford Explorer ST. Like other ST models, it wears some different components on the exterior, giving the SUV a sportier look. That same flavor continues to the cabin, where some unique designs further set this model apart from other Ford Explorers. A black mesh grille insert helps ensure the Ford Explorer ST will stand out from the rest of the lineup. In addition, there are also blackened lower bodyside details, roof rack side rails, and skid plate elements. You can add distinct 21-inch wheels to the SUV, which perfectly show off the performance brakes and big vented rotors. Of course, the biggest change that will be coming with the Ford Explorer ST is how far it pushes the performance envelope. While we were guessing before about its specs, Ford has revealed just how powerful and fast the SUV will be. The results sound pretty impressive. This will be the most powerful Ford SUV ever, using a specially-tuned 3.0-liter EcoBoost V-6 engine. Peak output is 400 horsepower and 415 lb.-ft. of torque, while the top speed is 143 mph. To help with these impressive figures, the engine pairs with a 10-speed automatic designed for quick shifts. Four-wheel drive is also standard and has different traction control settings. 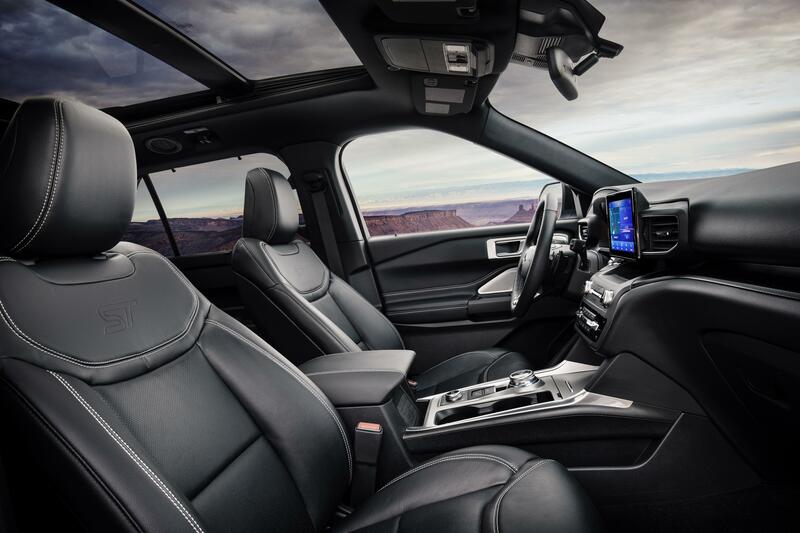 When you select the Sport driving mode, the whole SUV becomes even more engaging. The steering tightens, the suspension stiffens, the throttle responds quicker, and the gears hold for longer. Just because the 2020 Ford Explorer ST will provide thrills on the road doesn’t meant it won’t be a practical vehicle. After all, Ford SUVs are all about utilitarian use, and this version won’t be any different in that regard. A flat-bottom steering wheel helps you maintain the best steering angle both on and off the road, plus it has a heater for cold weather conditions. You also benefit from the leather sport bucket seats, which feature micro perforations for greater comfort. City Silver accent stitching and a special ST logo help add to the special feeling of those seats. Towing is one of the things an SUV should do well, and that’s true with the Ford Explorer ST. It comes standard with a Class III Trailer Tow Package with Cargo Management System, so you can bring a boat, four-wheelers, or whatever else along for a weekend of fun. Ford also includes Active Park Assist 2.0, taking the guesswork out of parking. It manages the steering wheel, brakes, shifter, and accelerator so you maneuver into any spot perfectly. Contact your local Ford dealer in Southern California to find out even more about the 2020 Ford Explorer ST.